Nana Akufo Addo said fixing the railway system was the surest way of dealing with Ghana’s transportation challenges. 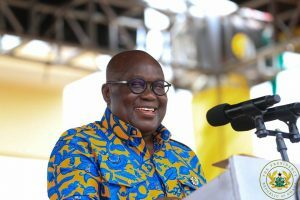 Speaking at a meeting with officials of Sky Train Consortium after signing an MOU with the South African company, Nana Akufo Addo said Ghana’s railway system needs to be fixed. Railways Development Minister, Mr. Joe Ghartey, signed the agreement for Ghana on the sidelines of the Africa Investment Forum in Johannesburg, South Africa. He emphasized that the Sky Train Project was the solution to the ever-increasing road traffic congestion in Accra, with its detrimental effects on economic activity, pollution and the quality of life. “There is confidence in the project. The promoters (Ai SkyTrain Consortium) are very serious, and that is why we invited the President himself to witness the signing. This should assure the investors that government is solidly behind it. The economics of this project are also good. We are very excited about the prospects,” he said. The African Investment SkyTrain Consortium is made up of Wilson Bayly Holmes, a construction engineering company in South Africa; BUNENGI Group, a project development company focused on developing projects in infrastructure; and Ai Capital, the investment and financing arm of the Ai Group, one of the most in influential international investment banking advisory groups focused on Africa. The post ‘Reviving the railway sector a priority’ – Nana Addo appeared first on Citi Newsroom.